As Chicago Public Schools plans mass school closings, its interests lie in public perception—not facilitating a space for students, parents and activists to defend their schools. Chicago officials announced last week that they plan to close fifty-four under-enrolled schools this year in the country’s third-largest district to help close a $1 billion budget deficit. It is the largest mass district closing of schools ever in the United States, and the announcement quickly inspired outrage among teachers, parents and activists. A teacher I spoke to, who worked at one of the schools marked for closures, expressed concern that the “welcoming schools” students will be transferred to lack social and emotional support systems to aid the students’ transition, and that some of the schools are far across gang territory, making the commute to the new schools more perilous than it already is in a city with infamous gun violence. Mayor Rahm Emanuel described the closings as tough, but needed. “If we don’t make these changes, we haven’t lived up to our responsibility as adults to the children of the city of Chicago. And I did not run for office to shirk my responsibility,” he said. Emanuel was out of town when schools chief Barbara Byrd-Bennett made the closures announcement. Many activists have called the proposal a racist decision that targets black, Latino and low-income communities, since the closures are happening mostly in poor black neighborhoods. “I don’t see any Caucasians being moved, bussed or murdered in the streets as they travel along gang lines, or stand on the steps of a CPS school,” said activist Wendy Matil Pearson as opponents of the school closing plans protested outside Horatio May Elementary Community Academy in the Austin neighborhood. Valerie Leonard, co-founder of the Lawndale Alliance, accused the mayor of trying to drive African Americans out of the city. The protesters said they don’t buy the mayor’s claim students will get better educations when they are moved out of buildings with low enrollment. The district has said the money saved from closing schools will be used to improve the “welcoming schools” where students are relocated. “It’s a lie!” protesters repeatedly shouted. 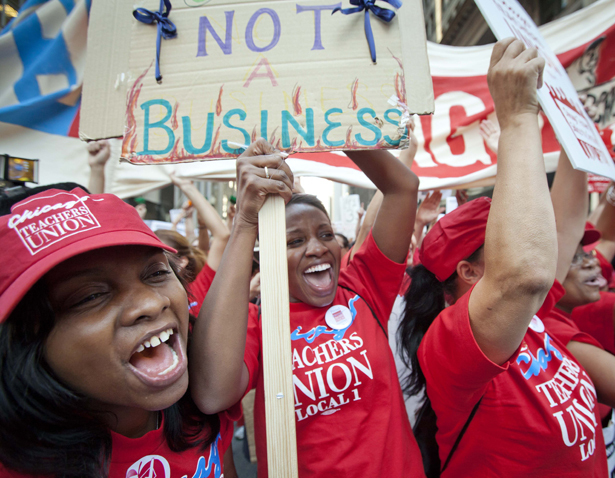 Activists called for a mass rally on Wednesday in response to the closures. Security staff responded by erecting barricades across the Board of Education in downtown Chicago, and authorities sent out a memo to school principals telling them to report on protesters and their actions. Curiously, the memo doesn’t mention how school closures are far more likely to “disrupt” education than a day of protest. Perhaps most alarming is the mention of First Amendment rights, surrounded by scare quotes. “Protestors often explain away their acts of disruption based on ‘1st Amendment rights’, but then go far beyond those rights in their acts.” At Firedoglake, Kevin Gosztola accurately points out that the Chicago Public Schools obviously misunderstand the meaning of the First Amendment. The section also claims “true threats,” which are words “directed against a particular person who would reasonably perceive in the message a danger of violence,” and “fighting words,” which are words “directed at a particular person, face-to-face, which might provoke an ordinary reasonable person to violence,” are prohibited. But, aren’t children supposed to tell people who say not nice things about them they don’t like those not nice things instead of hitting people? Yet, CPS, which must be staffed with individuals suffering from anger management issues, says “fighting words” might lead a “reasonable person” to engage in violence, as if it would ever be “reasonable” to violently attack someone for merely saying something combative to them. The memo appears to be an effort by CPS to transform schools into even more totalitarian places as students, parents and activist allies attempt to fight to maintain access to education. This has been a month fully of authoritarian actions by the CPS, following the banning of Persepolis, a graphic novel about growing up in Iran amid the Islamic Revolution. The novel was banned due to “graphic language and images,” according to Byrd-Bennett, referring to images of government torture. 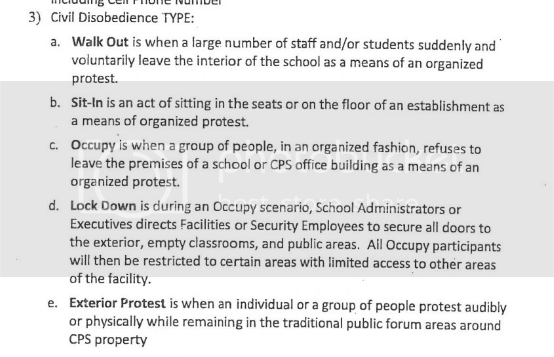 The document further warns that if civil disobedience does occur, the “names and information of all teachers and students who left the building” are to be documented. It also instructs the reader to document what media is covering the action. Becoming even more muddled, the memo lists a “lock down” as a form of civil disobedience, which isn’t correct. A lockdown is an administrative or security response to activists occupying a space. CPS seems much more concerned with managing the public’s perception of the mass closings than in facilitating a space for students, parents and activists to save their schools.